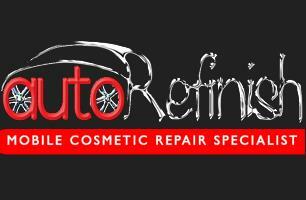 AutoReFinish - Garage/Vehicle Services based in London, Greater London. AutoRefinish was established in 2003. We are a mobile so can do the work at your home or office. We just need space next to your car and access to a power point. We have long extension cables so it doesn't have to be too close to your house. We have a 3m x 3m marquee in case it rains . We do a variety of cosmetic repairs to your car such as bumper scuffs, minor paint damage, vandal scratches, alloy wheel repair and alloy colour change. Also save money on end of lease repairs by bring your car to us before you hand it back.